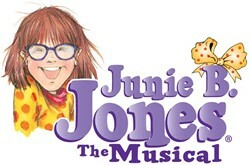 This year's musical production, Junie B. Jones, is in full swing. The show is a fast-paced, fun musical appropriate for the whole family. The run time is only about 90 minutes, so it is perfect for a leisurely afternoon or an early evening date. Students in grades 4-12 are part of the cast. It's Junie B. 's first day of first grade, and a lot of things have changed for her: Junie's friend, Lucille, doesn't want to be her best pal anymore and, on the bus, Junie B. makes friends with Herb, the new kid at school. Also, Junie has trouble reading the blackboard and her teacher, Mr. Scary, thinks she may need glasses. Throw in a friendly cafeteria lady, a kickball tournament, and a "Top-Secret Personal Beeswax Journal," -- first grade has never been more exciting. To order tickets, print of the attached flier, fill it out, send it to the HS with your money and I will hold the tickets for you at the door.